a potent and compelling witness to the extraordinary 1959 UFO “visitants” of Boianai Papua New Guinea. I am saddened to report on the passing of Reverend William (Bill) Gill on 13 June 2007 at the age of 79. His funeral service was held at the Church of Holy Trinity, Anglican Parish of Surrey Hills, Melbourne, Victoria, Australia. 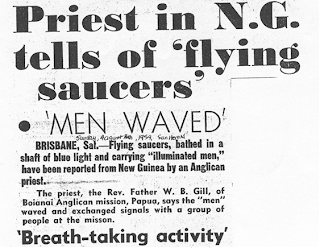 Reverend Gill became known to the UFO field for his famous UFO sightings at Boianai Papua New Guinea in June 1959. The sightings of June 26 and 27 1959 became widely recognised as some of the best in the history of the UFO mystery. Because of that status the sightings of the “Boianai visitants” also became the focus of attempts to explain them in diverse prosaic terms. They also became the target of often ill thought sceptical and debunking attempts. None of these adequately addresses the reality of the Boianai UFO entity sightings. Reverend William Gill’s observations were supported by 37 members of his native mission. Over the decades I got to know Bill Gill I learnt that he was an honest and thoughtful man, who was very tolerant of others, particularly when it came to consideration of his famous UFO sightings. We met on a number of occasions, talked extensively about his experience and corresponded over the years, about the Boianai events and other matters, beyond UFOs. He was a thoroughly likeable and impressive person. William Booth Gill’s life was an impressive testimony of a commitment to service and integrity. He got involved with professional stage work between 1933 to 1940 and was with the Air League/Army cadets between during the war years. He was educated at Mont Albert Primary, Trinity Grammar, studied Theology at Brisbane, Queensland’s St. Francis College (1948-1950) and education at Queensland University. He attended Monash University, Mercer House Teacher’s College and the Melbourne Victoria College of Divinity. Later in life Bill Gill undertook sociological research between 1986 and 1987 at Latrobe University. Academically he was very well accredited with a B.A., Th.L., Adv. Dip.Theology., Dip. R. Ed. Bill’s working life was just as impressive. He began teaching in Papua New Guinea in 1948. Bill Gill became an ordained priest in Queensland in 1950 and returned to mission work in Papua New Guinea, where he was also in educational administration between 1952 and 1959. Reverend Gill was the founding head of St. Francis’ Educational Centre at Port Moresby between 1953 and 1954. He even was a sessional broadcaster on 9PA radio at Port Moresby in 1953 and between 1959 and 1962 he tried his hand at freelance writing with the Brisbane Sunday Mail. Upon his return to Australia after his mission and education career in Papua New Guinea he taught at Essendon Grammar (1960-61), Camberwell Grammar (1962-1980) and St. Michael’s Grammar (1981-1987). In his travels Rev Gill apart from his lengthy stay in Papua New Guinea, he visited South Australia, Tasmania, Perth, Western Australia, the Australian east coast to Cairns, Thailand, England (where he did educational survey work and temping at Magdelan College in Oxham during 1971). He visited the United States during 1977 and 1978, lecturing in Chicago at North Western University, about his 1959 UFO experience. Reverend Gill talked about his experience in a documentary – “UFOs are Here” made in 1977 by Guy Baskin (a documentary in which I made an appearance as well – definitely a youthful “seventies” look). My last face-to-face time with Bill Gill was at the June 2003 Brisbane UFO conference which he gave his final UFO lecture. He had mixed feelings about giving this lecture and had asked me about whether to do it. I had mixed feelings about it as well, but for me apart from the personal side, wanting to meet up with him again, there was a firm sense of history. I told him that his presence would be a determining factor of my own decision to attend the conference. I assured him that he would be well received, even though the audience would be a mixed crowd. I videoed his Brisbane lecture – which is now a record of his last UFO lecture, a record I have made available to his family. Bill enjoyed the occasion. It was a great opportunity to catch up with him again and see him present his account of these remarkable sightings. By any measure Reverend William Gill was a remarkable man, with a life full of service and integrity. His intersection with the UFO mystery with the 1959 Boianai PNG UFO “visitants” was a potent and credible expression of the UFO mystery. In 1959 Papua New Guinea was still a territory of Australia. June of that year saw the spectacular "entity" sightings of Reverend Gill and members of his Boainai mission. Reverend Gill made notes about the experience and sent a copy of his own report - 8 closely typed foolscap pages - to Rev. Crutwell at Menapi Mission, who in turn sent a copy to Mr. D. H. Judge, a Brisbane member of the Queensland Flying Saucer Research Bureau. The report was released to the media and accounts appeared in the media during mid August, 1959, causing a sensation. I was privileged to have had two extended opportunities to interview Reverend Gill and discuss the events at Boianai. I was impressed with his quiet and certain manner in relating the events. Have a look at this extraordinary data. I am almost convinced about the "visitation" theory. There have been quite a number of reports over the months, from reliable witnesses. The peculiar thing about these most recent reports is that the UFO's seem to be stationary at Boianai or to travel from Boianai. The Mt. Pudi vicinity seems to be the hovering area. I myself saw a stationary white light twice on the same night on April 9th, but in a different place each time. I believe your students have also sighted one over Boianai. The A.D.O., Bob Smith and Mr. Glover have all seen it, or similar ones on different occassions - again, over Boianai, although I think the Baniara people said they watched it travel across the sky from our direction. I should think that this is the first time that the "saucer" has been identified as such. I do not doubt the existence of these "things" (indeed I cannot now that I have seen one for myself) but my simple mind still requires scientific evidence before I can accept the from-outer-space theory. I am inclined to believe that probably many UFO's are more likely some form of electric phenomena - or perhaps something brought about by the atom bomb explosions, etc. That Stephen should actually make out a saucer could be the work of the unconscious mind as it is very likely that at some time he has seen illustrations of some kind in a magazine, or it is very possible that saucers do exist, but it is only a 50/50 chance that they are not earth made, still less that they should carry men (more likely radio controlled), and it is still unproven that they are solids. It is all too difficult to understand for me; I prefer to wait for some bright boy to catch one to be exhibited in Martin Square. Please return this report as I have no copy and I want Nor. (Rev. Norman Crutwell - B.C.) to have it. Life is strange, isn't it? Yesterday I wrote you a letter, (which I still intend sending you) expressing opinions re the UFO's - Now, less than 24 hours later I have changed my views somewhat. Last night we at Boianai experienced about 4 hours of UFO activity, and there is no doubt whatsoever that they are handled by beings of some kind. At times it was absolutely breathtaking. Here is the report. Please pass it round, but great care must be taken as I have no other, and this, like the one I made out re Stephen, will be sent to Nor. I would appreciate it if you could send the lot back as soon as poss. P.S. Do you think P. Moresby should know about this? (N. Cruttwell is at present in the Daga country and will not be returning home until 16th July at earliest.) If people think it worth while, I will stand the cost of a radio conversation if you care to make out a comprehensive report from the material on my behalf!! It's interesting Territory news if nothing else. Patches 6.45 Sighted bright white light from front direction N.W. clear over 6.50 Call Stephen and Eric - Langford. Dogura and 6.52 Stephen arrives. Confirms not star like other night. 6.55 Send Eric to call people. One object on top, move - man? 7.00 Men 1 & 2 again. covered sky Thin elct. blue spot light. c. 2000' Men gone, spot light still there. 7.12 Men 1 & 2 appear - blue light. 7.20 Spot light off, men go. 7.20 UFO goes through cloud. Clear sky 8.28 UFO seen by me overhead. Call station people. here, heavy Appeared to descend, get bigger. cloud cover Not so big, but seemed nearer than before. over Dogura 8.29 Second seen over sea - hovering at times. 8.35 Another over Wadobuna village. Clouds forming ? Another to the east. cloud - no more than 2000', probably less. Clouds All UFO's very clear - satellites? patchy "Mother" ship still large, clear, stationary. 9.10 "Mother" ship gone - giving red light. No. 1 gone (overhead) into cloud. 9.46 Overhead U.F.O. re-appears, is hovering. 10.10 Hovering, gone behind cloud. 10.50 Very constant overcast, no sign of U.F.O. As indicated by his notes made at the time and in numerous interviews, Rev. Gill saw a bright white light in the north western sky. It appeared to be approaching the mission. The object appeared to be hovering between three and four hundred feet up. Eventually 38 people, including Rev. Gill, Steven Gill Moi (a teacher), Ananias Rarata (a teacher) and Mrs. Nessie Moi, gathered to watch the main UFO, which looked like a large ,disc-shaped object. It was apparently solid and circular with a wide base and narrower upper deck. The object appeared to have 4 "legs" underneath it. There also appeared to be about 4 "panels" or "portholes" on the side of the object, which seemed to glow a little brighter than the rest. At a number of intervals the object produced a shaft of blue light which shone upwards into the sky at an angle of about 45 degrees. What looked like "men" came out of the object, onto what seemed to be a deck on top of the object. There were 4 men in all, occassionally 2, then one, then 3, then 4. The shaft of blue light and the "men" disappeared. The object then moved through some clouds. There were other UFO sightings during the night. Rev. Gill described the weather at variable sky - scattered clouds to clear at first, becoming overcast after 10.10 pm. He estimated the height of the clouds at about 2,000 feet. The first sighting over the sea, according to Rev. Gill, seemed no more than 500 feet above the water at times. When the main UFO was at its closest point, Rev. Gill determined that the relative size at arms length was a full hand span or about 8 inches. He modified that estimate to 5 inches. It was clearly visible and seemed mostly stationary during 25 minutes of observation. "Large U.F.O. first sighted by Annie Laurie at 6 p.m. in apparently same position as last night (26/6/59) only seemed a little smaller, when W.B.G. saw it at 6.02 p.m. I called Ananias and several others and we stood in the open to watch it. Although the sun had set it was still quite light for the following 15 minutes. We watched figures appear on top - four of them - no doubt that they are human. Possibly the same object that I took to be the "Mother" ship last night. Two smaller U.F.O's were seen at the same time, stationary. One above the hills west, another overhead. On the large one two of the figures seemed to be doing something near the centre of the deck - were occassionally bending over and raising their arms as though adjusting or "setting up" something (not visible). One figure seemed to be standing looking down at us (a group of about a dozen). I stretched my arm above my head and waved. To our surprise the figure did the same. Ananias waved both arms over his head then the two outside figures did the same. Ananias and self began waving our arms and all four now seemed to wave back. There seemed to be no doubt that our movements were answered. All mission boys made audible gasps (of either joy or surprise, perhaps both). "As dark was beginning to close in, I sent Eric Kodawara for a torch and directed a series of long dashes towards the U.F.O. After a minute or two of this, the U.F.O. apparently acknowledged by making several wavering motions back and forth. Waving by us was repeated and this followed by more flashes of torch, then the U.F.O. began slowly to become bigger, apparently coming in our direction. It ceased after perhaps half a minute and came no further. After a further two or three minutes the figures apparently lost interest in us for they disappeared "below" deck. At 6.25 p.m. two figures re-appeared to carry on with whatever they were doing before the interruption (?). The blue spot light came on for a few seconds twice in succession." Reverend Gill has described how he and the mission people called out to the men, even shouting at them, and beckoned them to descend, but there was no respond beyond what has already been noted. Two smaller "UFOs" higher up remained stationary. By 6.30 p.m. the scene had remained largely unchanged. Rev. Gill records that he went to dinner. At 7.00 pm, the "No.1 UFO" was still present "but appeared somewhat smaller". The group of observers went to Church for Evensong. After Evensong (about 7.45 pm) visibility was very limited with the sky covered in cloud. Nothing else was seen that evening. At 10.40 pm, a very penetrating "earsplitting" terrific explosion woke up people on the station. It sounded like it had come from just outside the window of the mission house. Rev. Gill felt it did not sound like a thunderclap. Nothing had been seen, but the whole sky was overcast. Other less compelling activity occurred the following night. Then it seemed the Boianai visitants had gone. The controversy had just begun. Reverend Gill was at the time of his sightings already scheduled to return to Australia. This presented civilian groups with an excellent opportunity to assess the bonafides of the reports. All investigators found Gill to be very impressive. His credibility was enormous. This lead one of the leading civilian groups, the Victorian Flying Saucer Research Society, to view the Gill reports as constituting the most remarkable testimony of intensive UFO activity ever reported to civilian investigators in the entire history of UFO research. VFSRS indicated that they were unique because for the first time, credible witnesses had reported the presence of humanoid beings associated with UFOs. The VFSRS report concluded that the Boianai UFOs were advanced craft, manned by humanoid beings, capable of a fantastic aerodynamic performance. VFSRS now felt that UFO researchers no longer needed to enquire as to the nature of UFOs, now only their origin was to be determined. The major civilian groups of the day, in a spirit of new found cooperation inspired by the significance of the Boianai observations, distributed copies of Reverend Gill's own sighting report to all members of the House of Representatives of Australia's federal parliament. A circular letter accompanied the report, signed by the presidents of the participating civilian UFO groups, urging members of parliament to press the Minister for Air for a statement about the attitude Air Force Intelligence had of the New Guinea reports. On November 24th, 1959, in federal parliament, Mr. E.D. Cash, a Liberal politician from Western Australia asked the Minister for Air, Mr. F.M. Osborne, whether his department (specifically Air Force Intelligence) had investigated "reports of recent sightings of mysterious objects in the skies over Papua and New Guinea." The Minister's reply did not address this question, but instead he focused on the general situation indicating that most sightings were explained and "that only a very small percentage - something like 3 percent - of reported sightings of flying objects cannot be explained". A close analysis of the reports argues powerfully that the RAAF "explanation" of "either known planets seen through fast moving cloud, or natural phenomena" was unsatisfactory. Over the years there have been a number of attempts to explain the Boianai sightings, including astronomical misidentifications, hoax, cargo cult effects, and that Rev. Gill had myopia and astigmatism (Rev. Gill was wearing correctly proscribed glasses). None of these explained have satisfactorily adress the evidence. Astronomer and former US Air Force consultant, Dr. Allen Hynek, and his Center for UFO Studies (CUFOS), went to great lengths to investigate and research the affair. Dr. Hynek and Allen Hendry, the then chief CUFOS investigator, concluded the "lesser UFOs' are attributable to bright stars and planets, but not the primary object." Its size and absence of movement over three hours ruled out an astronomical explanation. My own discussions with Rev. Gill led me to the same conclusion. Most recently there was an attempt at explaining the whole affair away as Rev. Gill and the other witnesses being confused by a false horizon, and that all they had been watching was a brightly lit squid-boat and crew too busy to do more than just wave at the people on shore. This idea is not tenable when one realises that Rev. Gill was certain that the object he saw was at a 30o elevation in the sky. Only a massive tidal wave might have elevated the horizon ocean line to have a boat high enough to fit that viewing perspective. I suspect Rev. Gill and the Papuans may have noticed that! A mirage is also not tenable given the circumstances of the event. The Boianai visitations are even enshrined in a classic piece of Australian fiction. Award winning Australian novelist Randolph Stow's 1979 book"Visitants", which has the Boianai visitations as a backdrop to a striking story of confrontation and disintergration, emerged from Stow's experience as a cadet patrol-officer in Papua-New Guinea. He was an assistant to the Government Anthropologist. His novel opens with this sentence, "On 26 June 1959, at Boianai in Papua, visitants appeared to the Reverend William Booth Gill, himself a visitant of thirteen years standing, and to thirty-seven witnesses of another colour." The Boianai "visitants" still stand as remarkable evidence for an impressive aerial anomaly and are regarded as some of the best entity reports on record. At the time of writing I spoke again with Rev. Gill. He still remains puzzled by what he saw and was pleased that an authority like Dr. Hynek had independently interviewed him and some of the other witnesses and travelled to the site. While he accepts that the sightings remain unexplained, Rev. Gill questioned my characterisation of some attempts to explain them as "silly". He felt that these "explanations" were serious attempts to bring understanding to the events. I think that attitude encapsulate the integrity of Rev. Gill and the reality of the affair. The clipping is from the Sydney newspaper the “Sun-Herald” August 16 1959. The image is from a video I took from Rev Gill's last UFO lecture, Brisbane, 14th June 2003. I have prepared a memorial DVD of that last presentation. If there is interest in this DVD please contact me for details. Can you allow me to advertise my online business in your blog? it will be a great help if say yes. thanks a lot! You helping a lot of PPL thanks for your golden ideas about home based jobs. Learn How I Earn $50 to $250 Every Day! Hello. Photo of reverend Gill is probably a screenshot from the video. May you have this video? I would like to have a copy or to buy it.